Goodrich has always been quite the producer, even when that production came on the football field. As a split end for the Woodrow Wilson High School Wildcats, he was named a high school All-American twice, in both 1962 and ‘63. 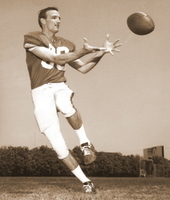 Years later, he was named to Texas Football Magazine’s 40th anniversary Super Team. A fantastic all-around athlete, Goodrich earned three letters in track and basketball as well. He earned a football scholarship to SMU, where he played on the Mustangs’ 1966 Southwest Conference championship team. In 1971, he joined ABC Sports as a production assistant and quickly worked his way up the ladder within that organization. He served as producer for ABC’s “Monday Night Football,” the Super Bowl, the Indianapolis 500 and helped spearhead the network’s coverage of several Olympics. A 15-time Emmy winner, Goodrich is currently a freelance television producer, director and consultant for various companies, including ABC/ESPN.